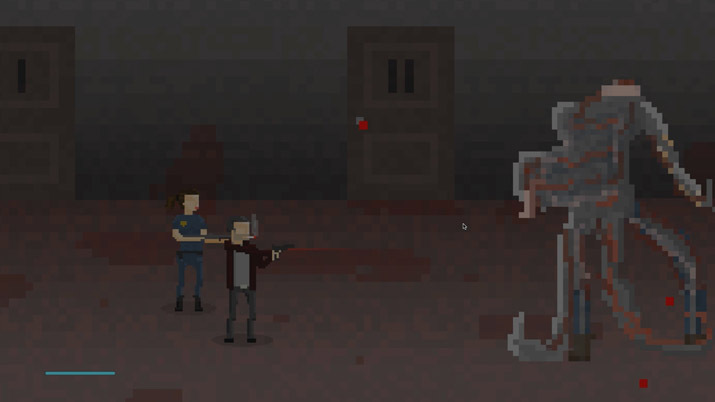 1166: the action-horror sidescroller that wishes it could be a low-budget afternoon horror film. The game has charm, but there’s not much that keeps a player wanting to play this title. The graphics are simple, and at times purposefully disjointed in an attempt to portray alternate dimensions and dream states. While a brush with the occult always tends to be a good time, the repetitive nature of 1166 leaves us uninspired and frustrated. The crux of the story is based around a murder and demons being unleashed upon the world. You play as multiple characters throughout the narrative, creating small, episodic scenes that weave themselves into a grander story. From a strict plot perspective, 1166 isn’t so bad. It even has mildly creepy music and enigmatic dialogue that keeps you guessing. Other aspects of 1166 don’t hold up as well. Long scenes of you walking through pixel landscapes make for neither suspense nor entertaining gameplay. 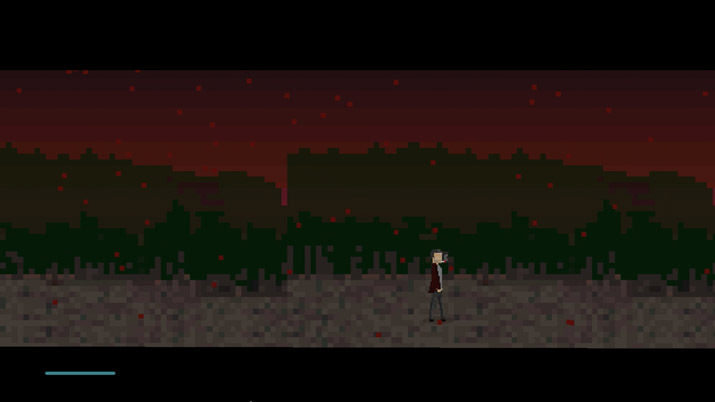 While the monologues did imbue a sense of character, it was not enough to feel scared for my pixelated character as they wandered through recurrent city blocks. There was a sense that something bigger was going on behind the scenes, however poor game mechanic choices inhibited discovery. Unique scene cuts and a strange dream sequence immediately foster a strong sense of psychological horror, and if you are a fan of cheap, b-movie horrors, you might enjoy what 1166 is trying to do. If not, you’ll probably become frustrated, not frightened, by your experience. ...I could nearly see the zipper on the costume the whole time; 1166 required no immersion or tactically interesting choices. Action sidescroller fans may be disappointed as well, combat is overly simple and the hitboxes for enemies are burdensome. There’s one attack you can make for each character, with no real differentiation between characters other than graphics. Enemy AI is dull and has nothing in the way of unique attacks. While their graphics were fascinating, and have a touch of the lovecraftian, I could nearly see the zipper on the costume the whole time; 1166 required no immersion or tactically interesting choices. Even the simple combat mechanics are clunky, creating frustrating movement situations and overly-long walks along barren pathways. 1166 did benefit from a willingness to try something different and expand how narratives are told through video games. The end product of this particular game didn’t turn out as well as the idea sounds, but I’ll give it to Predator Productions (the developers) for pushing beyond the norms of the genre. 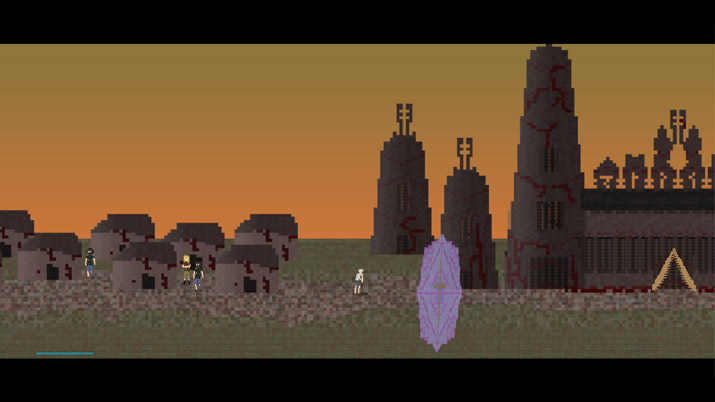 After about the fifth character walking through a barren landscape with nothing to do, any feeling of suspense of horror quickly vanishes as you move trudge onward at a plodding pace. It’s even possible to walk the wrong way for a lengthy period of time, only to find yourself at the end of the map, as if the movie reel were prematurely cut. 1166’s concept and style is going in the right direction, but the release feels like a first draft to a dimestore horror novel. The title needs an overhaul at a fundamental, structural level; for example, level design, or combat. Straightforward narratives (albeit strange, disjointed, and slightly creepy) leave little for a player to feel inspired. 1166 offers the equivalent of a B-movie horror in video game form, complete with all the quirks and mistakes that come with small budget productions. If you want a new take on side-scrolling storytelling that mixes Lovecraftian style occult horrors with surreal walks through pixel fields, you’ll feel right at home in 1166. Watch that the arbitrary level design, simplistic game mechanics, and poor choice of graphics don’t keep you from experience a potentially psychologically disturbing adventure through dimensions and time.